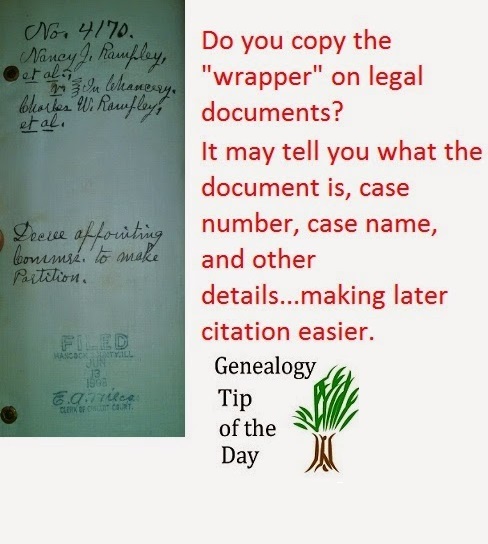 After learning the hard way, I always copy the “wrapper” on any legal document of which I make copies. In addition to usually indicating what the document actually is, there will be a filing date and other details of the case. Making a copy or taking a picture means I don’t have to write all that information down. But I do need to capture it so that I can later cite the records used. It’s fast. It’s easy and gets the job done when you’re researching on site and time is of the essence. Learn more about citations in Evidence Explained or subscribe to Casefile Clues to learn more about record analysis, documentation, and interpretation. ← Do You Know One Pitfall?